Emergency Disaster Related: Forest Fire Detection By Satellite - Emergency Alert and Notification for Emergency Alerts and Community Warnings. 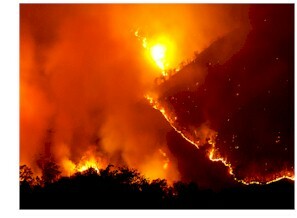 A fully automatic system has been developed to detect forest fires using data from the meteorological NOAA satellites. The system has been developed in Finland and tested in four experiments in 1994-1997 in Finland and its neighbouring countries Estonia, Latvia, Russian Karelia, Sweden and Norway. For each detected fire, a telefax including data on the location of the fire, the observation time and a map showing the location, is sent directly to the local fire authorities. The area with the smallest forest fires detected was 0.1 ha. The time delay between receiving the NOAA scene and the sending of the fire alert was 31 minutes in average. Nearly all detected fires were forest fires or prescribed burnings. In the pilot experiment of the summer 1997 a total of 363 fires were observed and alerted. 83% of the given alerts were real fires. None of the real forest fires in Finland remained undetected. The good verification results show that satellite-based detection of forest fires has potential in sparsely populated areas if continuous supply of middle-infrared satellite data can be guaranteed in the future. Wild fires are an essential threat to forest resources and human population in large areas of the world. Very often, the cities or villages do not continuously follow the news of the surrounding areas of the cities to get early warning of the approaching forest or bush fires. In addition, in many cases the authorities do not have telecommunications equipment e.g. telefax machines or even paper for the machine to send/receive the warning messages. Therefore, alerts to the population and to the rescue forces often come too late. For such occurrences as forest and vegetation fires, volcanic activity or burning oil spills and coal seams a dedicated space instrumentation does not exist. The existing spaceborne instruments and the missions are not designed for fire detection, e.g. time coverage for fire management is not satisfactory. Therefore, fire management is only a by-product of the current remote sensing missions. New dedicated instruments, procedures and missions are needed. A prototype software has been developed by VTT Automation for the automatic detection of forest fires using NOAA AVHRR (Advanced Very High Resolution Radiometer) data. Fire detection is based on middle-infrared data channel 3 of AVHRR, 3.7 µm. Image data are received from an a receiving station operated by the Finnish Meteorological Institute. From each received scene a sub-scene covering the monitoring area is extracted (typically 1024 rows by 1024 columns, approximately 1150 km by 1150 km). The image data is transmitted via a computer network. Channels 2 (near infrared), 3 (middle IR), and 4 (thermal IR) of the AVHRR sensor are used. The processing includes: detection and marking of image lines affected by reception errors, image rectification, detection of hot areas, elimination of false alarms, and generation of alert messages by e-mail and telefax. Detection of fires is based on the use of channel 3 data. The thermal infrared data is of little value in the detection of small forest fires in Boreal forests. A typical small forest fire that can be detected using middle-infrared data does not at all affect the thermal infrared data (12 µm) in channel 4. Each patch of connected "hot" pixels is considered as a potential fire. The fires, where the imaging geometry is close to the case of specular reflection, are eliminated as false alarms. Four additional constraints are also applied: 1) a threshold on near infrared channel 2 data to eliminate clouds in day-time scenes, 2) a threshold on thermal infrared channel 4 data to eliminate clouds in day-time and night-time scenes, 3) a threshold on the number of pixels in a fire patch, and 4) a threshold on the distance to known steel factories (added in 1996). The prototype system was tested in an experiment phase during the summers 1994-97. In summer 1995 the system was tested in cooperation with VTT Automation, the Finnish Ministry of the Interior, the Finnish Meteorological Institute, and the City of Helsinki Rescue Department. Also, local correspondents were available in the neighbouring countries. The prototype fire detection system was run in the computer facilities of the Finnish Meteorological Institute. 205 AVHRR scenes were processed between 4 July 1995 and 8 September 1995. The system detected over 14 000 potential fires (hot areas). 85 of the potential fires were classified as fires by the automatic system. A preliminary verification was done immediately for fires located in Finland. For each detected fire, the system sent a telefax message to the City of Helsinki Rescue Department. The fire was located on a map and the telefax (equipped with a request for prompt verification of the detected fire) was further sent to the right local rescue department. Of the 16 fires detected in Finland 11 were prescribed burnings, one case was a forest fire, three cases were a steel factory, and in one case the reason of the detected fire is not known so far. In summer 1996, the system was running from 24 June to 16 September. After the elimination of false alarms 272 fires were detected. In 30 cases elimination was caused by the location of a known steel factory. For 79 fires real-time telefax message was sent fully automatically. Most of the detected fires were prescribed burnings. In other cases, the fires were outside of the experimental area. For the summer 1997 the experimental area was enlarged from the original (approximately 1150 km by 1150 km) to cover the whole area of Norway, Sweden, Finland, Estonia, Latvia, and Russian Karelia, approximately 1690 km by 1690 km. In summer 1997, the system has been running from 5 May until 15 September. During that time 1013 hot areas were detected, most of them in Russia and in Lithuania outside of the project area. 363 fires were located in the area of Norway, Sweden, Finland, Estonia, Latvia, and Russian Karelia and the corresponding alerts were sent automatically. Verifications were received from local authorities in 162 cases. 83% of the alerts were real fires, most of them forest fires. The amount of detected building fires was 6. 17% of the alerts were false alerts or unknown fires. According to reports from the local authorities, none of the real forest fires in Finland remained undetected. The area of the smallest forest fire detected was 0.1 ha. During the summer 1997 an average of 5 NOAA images were processed daily. The average delay between the receiving of the NOAA scene to sending the fire alert was 31 minutes. The screening of false alarms is an essential technique in fire detection if the results are to be used in fire control. Effective screening enables fully automatic detection of forest fires, especially if known sources of error like steel factories are eliminated based on their location. In the experiment in 1994-97, most of the detected fires were real fires. Only 17% of the sent alerts were false alerts. None of the real forest fires is known to be undetected by the system. This shows that satellite based detection of forest fires is reliable, fast and has potential for fire control purposes. Because of its ecological and human necessity, fire monitoring and fire alert systems should be established urgently on a global scale. This can only be done by remote sensing from space, because other systems are not suitable for global applications. 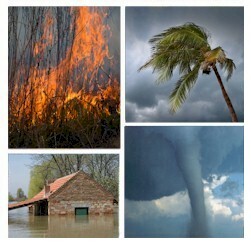 With our emergency notification phone service, you can broadcast warning messages to thousands of households in your community warning of catastrophic disasters including forest fires. Messages can be simultaneously delivered in just minutes using our network of phone systems and services. Pre-recorded warning messages can be played giving households information regarding the forest fires location and whether a community evacuation is planned or necessary. You can send a broadcast warning to specific neighborhoods or communities in the event of a wildfire and provide priority delivery of these messages to those nearest the fire danger. Multiple messages can be delivered to different members of the community based upon proximity to the blaze. Calls can be directed to operators that are standing by to handle special individual emergencies. Messages can also be broadcast seeking volunteers or special assistance from emergency personnel.